As my clients moved through their house, updating as they went, it was time to address the kitchen. 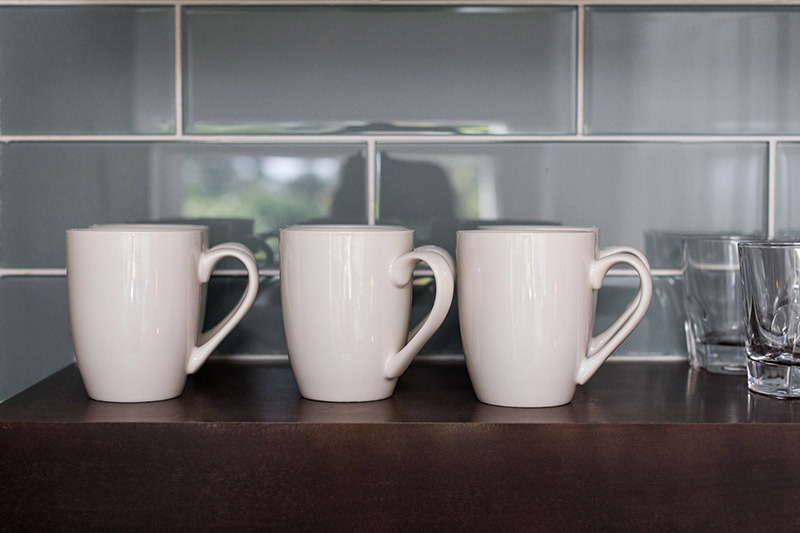 After finding out we weren’t going to be able to open the wall we so desperately wanted to, we needed to focus on making use of the space we had while still incorporating important elements my clients felt they were missing – storage, better organization, more counter space and a beverage area! Even though we weren’t able to remove the wall, we were able to widen the existing entry into the kitchen so it didn’t feel quite so removed from the surrounding great room. To add the much needed, BIGGER pantry, we had to remove a window, but with a large skylight, the room still has ample natural light. The space that once housed the dining table was then dedicated to the pantry and beverage center. 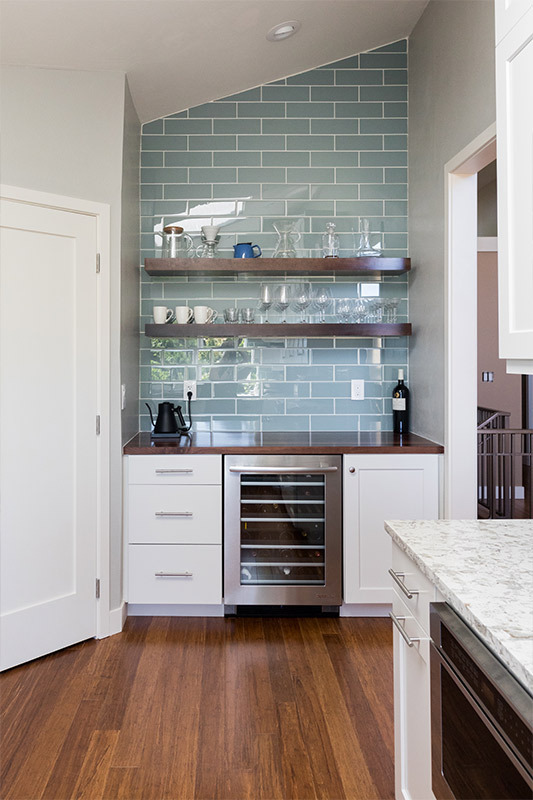 A beverage center whose blue subway tile, butcher block counter and floating shelves, looks pretty wicked, if I do say so myself. 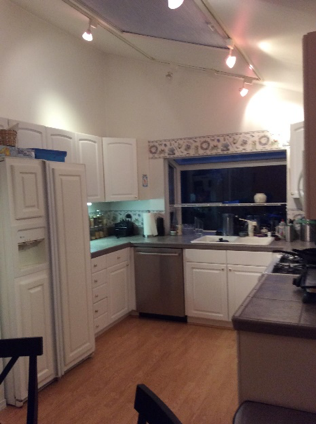 The fridge was relocated allowing for a complete wall of cabinets and uninterrupted countertop. The existing hardwoods continue in the kitchen adding to the continuation of spaces. 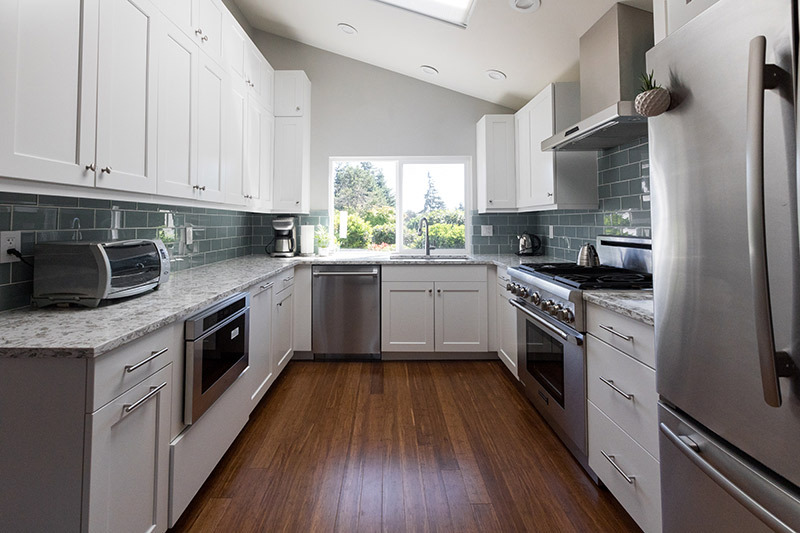 Minimal, white shaker cabinets brighten the room and help to solidify that mid-century modern feel my clients were seeking. 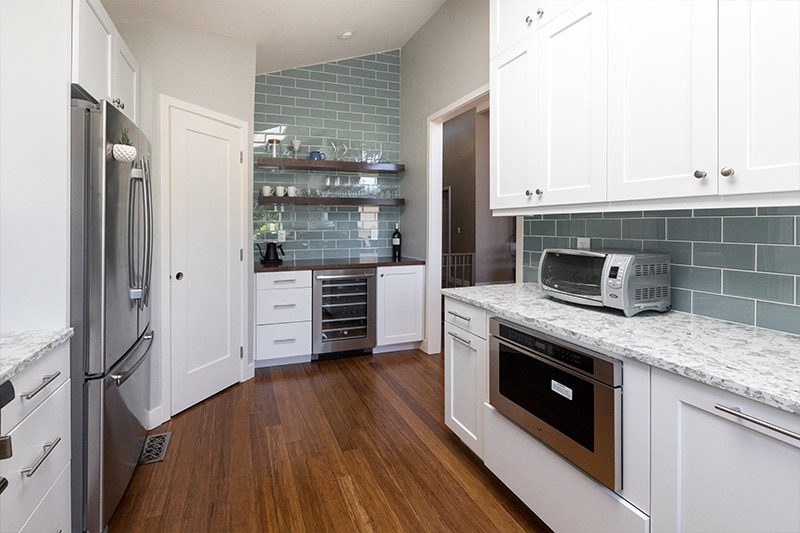 However, my clients’ personality and that of the space shines through in the subway tiles’ pop of color. 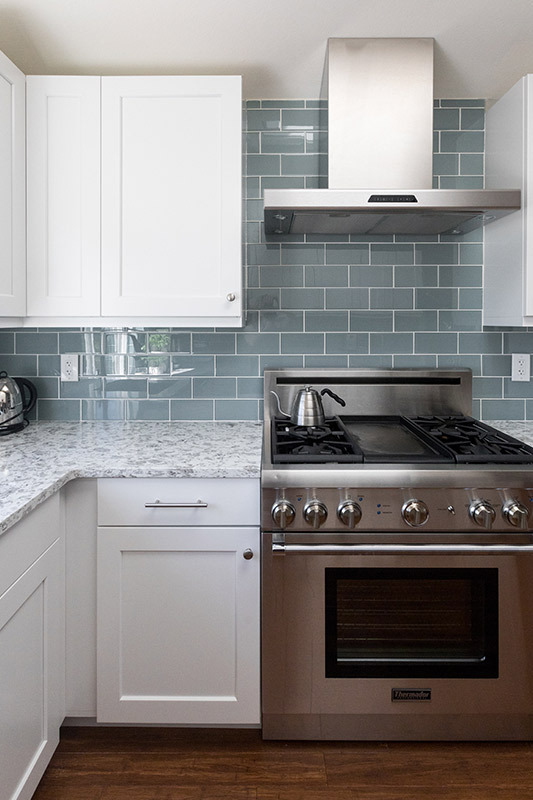 OK – maybe it’s a little more than a pop of color, but it takes this kitchen to the next level. 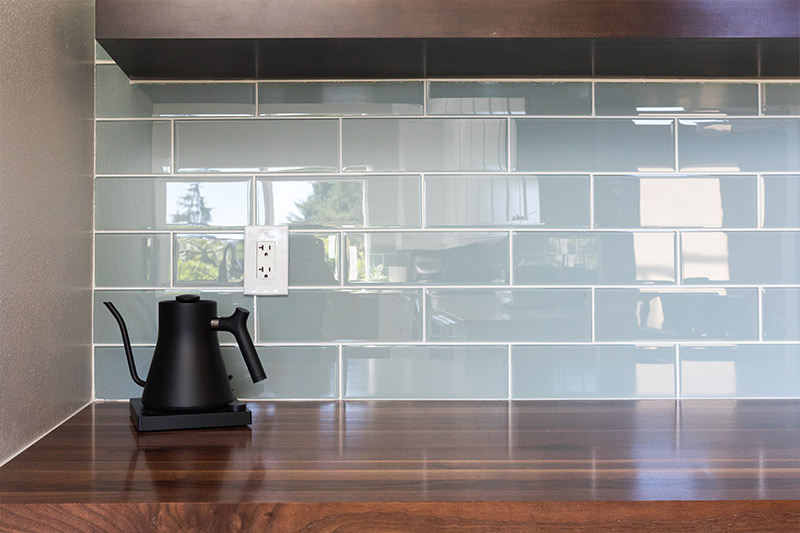 The shiny, blue tile is an unexpected move that completely transforms this space. Material choice in this project had more of a significance because the kitchen’s shape and size didn’t change and was still rather confined. Because of this, the layout needed to be organized purposefully, leaving the real transformation up to the material. 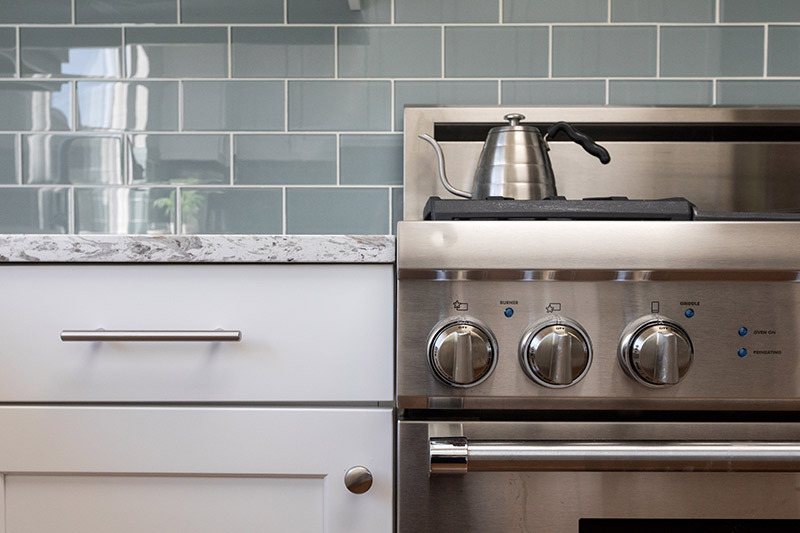 The play between wood, stone and glass, neutral tones with pops of color created a perfect juxtaposition that took this kitchen from serving its purpose to a whole new space that represents my clients’ styles and personalities.